Andrew Jackson was our 7th President, following John Quincy Adams. He was born before the American Revolution, on March 15, 1767. 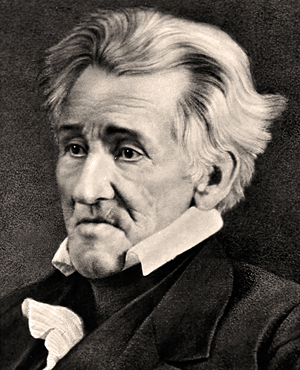 From the National Archives, a photo of Andrew Jackson in his later years, by Matthew Brady. This entry was posted on Saturday, March 16th, 2019 at 1:09 pm and is filed under History, Presidents. You can follow any responses to this entry through the RSS 2.0 feed. You can leave a response, or trackback from your own site. Photography really got started in 1837, which was the last year of Jackson’s presidency (in March). It was impossible to have photos of him as a young man. There may be a life mask or two — but most of the images we have of him are from portraits and sketches, and they wander a lot over what he looked like, I think. The only photos are of Jackson as an old man. With some imagination, you can see he was striking in his youth. There is an old Dagurreotype, and a couple of other photos, maybe another photo from this same session. Similarly, we only have one photo of John Quincy Adams, again as an old man. Quincy was also born in 1767. Brady and his colleagues really got photography going in America, and the fact that so many archives and libraries collected Brady’s photography helps a lot. Matthew Brady always produced outstanding photos. I don’t believe I have seen one of Andrew Jackson in his older years.